Wash all of the vegetables well, especially if they are not organic. Peel the black radish, turnip, carrots and the Jerusalem artichokes. With a mandoline, or very sharp knife, finely slice all of the vegetables for the carpaccio and place them on a large plate, in one layer if possible. In a small bowl, mix the lemon juice with the sugar and the oils. Pour the marinade onto the sliced vegetables. Cover with cling film (plastic wrap) and transfer to the refrigerator for at least two hours. Turn the vegetables once or twice while they are marinating. 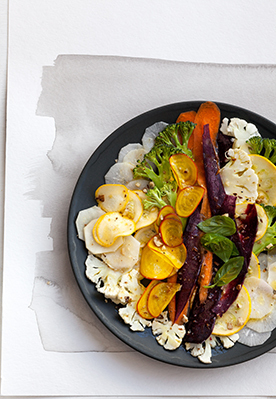 Just before serving, sprinkle the vegetable carpaccio lightly with sea salt, pepper, and the chopped hazelnuts. Garnish with fresh basil leaves.